Hi, my name is Skittles. I know that you know who I am because you so generously contributed to my medical care when I first arrived at GALT. After 259 races (Whew!!! that's a lot of times around the track!!! ), I was found wandering on a farm north of Hillsboro, Texas, on October 26, 2006. I don't remember much before that time and I was soooooo weak, skinny, and sick when I was found. GALT volunteers rushed me from this vet to that vet – and they all stuck needles in me (I know – it was because I was sick and needed medicine). Foster families gave me soft blankets where I could lay and gave me more food than I could imagine eating at one time. But best of all, everyone who saw me just stroked me and told me how much they loved me, and that I was going to get better and would have fun again. 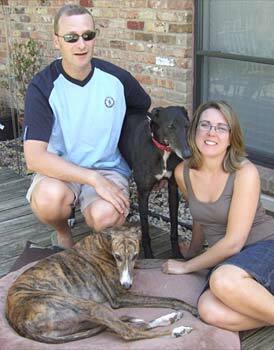 I never had any idea there were so many Greyhound Angels. People who don't even know me wanted to help me get well. How do you tell people "thank you" for that kind of love? I felt so blessed. I had hundreds of humans looking out for me. And I am even more lucky that I found two very special humans, Claire and Malcolm, to be my very own family. I was adopted in January 2007. I will forever be a part of their family. Skittles came to our family in mid-January as a scared fluffy pup... Some two months on, he now has a sleek, shiny black coat and an amazing personality! He has found his voice, which he uses to communicate his needs - food, walks, etc. - or just to let us know how excited and happy he is!! We are no longer in need of an alarm in the morning, as Skittles (like clockwork) will "nose" us both at 7:30am, before performing a rooooo to wake us properly! As with any dog arriving into new surroundings, he is still learning and some things still bemuse or spook him, but he is a curious little man and as the days go by he starts to realize that life isn't all bad living in a house!! We are especially thrilled that he and our other Greyhound, Dafney get on so well - they share beds, bones and the occasional kiss!! It's so wonderful to see! To have been through what our Mr. Skittles has been through and have so much love and trust in us, is amazing and humbling. We are so grateful to all of those who helped with his medical costs and needs so that we are now fortunate enough to provide his forever home and have him as part of our lives. So now that I'm fully recovered and doing what all Greyhounds should do in retirement, I wanted to send my heartfelt thanks to everyone who helped me get to the place where I am today. You don't have to worry about me anymore. But I know you will find another Greyhound who needs your help – Angels are like that.